Foil packets are easy camping food. The food actually steams in the packet, making for a healthy way to serve dinner. And it's a great way to get kids to eat their veggies. 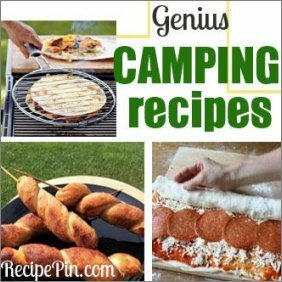 Be sure to use heavy duty aluminum foil so the foil doesn't rip and the dinner doesn't burn. 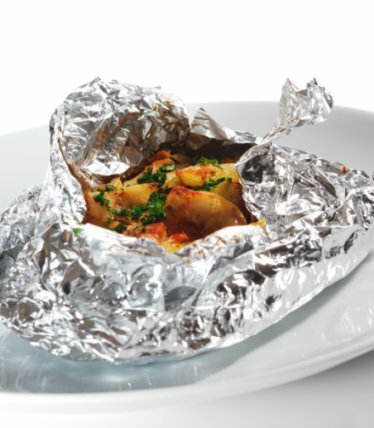 Use a cooking spray like Pam to spray the inside of the foil before adding the food so the food doesn't stick. Hard vegetables like potatoes can take longer to cook than the rest of the packet, so cut them into small pieces. Placing the meat on the bottom of the packet will help ensure that it cooks well as it is another item that will take longer to cook. I alway put the meat on the bottom, then potatoes on top of the meat, if pototoes are used. The best way to check if a packet is done is to open it up. Be careful of the steam when first opening the foil packet. 2 main types of foil packets are regular flat packets and tent packets. The tent packets allow for extra steam and so are used more for vegetables. To make a tent packet, just crimp the foil closed as normal but leave a few inches of empty space above the food, creating a little tent. Tear of 2 squares of foil, enough to make 2 packets. Mix together all of the above ingredients, except the shrimp. Add the shrimp and coat thoroughly. Place half of the shrimp onto one foil square and the rest on the other; fold both into packets. Grill over high heat for eight minutes. Yield: 2 servings. Tear off a piece of foil large enough to accommodate all six wings and be folded into a packet. Mix together oil and jerk seasoning and coat wings with mixture. Place the wings on a large section of foil and pour mixture over them. Wrap loosely to form a tent packet (fold seams tightly). Place on grill over high heat. Cook for 25 minutes turning only once. Serve wings topped with cilantro and a lime or lemon wedge. Preheat grill to medium heat. Tear off a large piece of foil. Peel and cut potatoes into slices (french fry style), then coat with garlic salt, diced onion, salt and black pepper. Place potato mixture on foil and sprinkle a generous amount of Parmesan cheese and place dots of butter on top. Wrap foil around potatoes sealing tightly. Cook over medium heat, turning packet often. Yield: 4 servings. Preheat the grill to hot. Clean mushrooms and slice thick (1/2 inch). Tear off 4 heavy duty aluminum foil squares measuring 12 x 12 inches. Mix together the sliced mushrooms, herbs, garlic, 2 tablespoons olive oil and salt and pepper; blend well. Brush the dull side of the foil with olive oil. Place equal portions of mushrooms on each foil square. Fold foil over mushrooms, sealing tightly, place on hot grill for 20 to 25 minutes. Mushrooms should be juicy and tender when done. Great as a side dish or served on top of a juicy steak. Preheat grill to medium heat. Tear off a long sheet of foil, about 20 inches. Place vegetables in the center of foil and sprinkle with basil, garlic, salt and pepper. Drizzle oil over all. Fold the foil over the veggies, leaving a "tent" of a few inches of space over the food. Seal tightly. Place the veggie packet on the top rack of your grill, cover and cook 10 to 15 minutes. Do not turn the packet. Carefully remove packet from the grill and place on serving plate. Yield: 2 servings.